ISLAMABAD Despite widespread outrage over the Taliban shooting of a female teenage activist, Pakistani leaders and opinion makers are divided over whether the government should respond by targeting the militants' last major sanctuary along the Afghan border. The U.S. has long pressed Pakistan to launch an operation in the remote and mountainous North Waziristan tribal area, home to enemies of Islamabad as well as to militants fighting U.S. troops in Afghanistan. The recent attack on 14-year-old Malala Yousufzai has given new momentum to the debate. One side argues the government should harness anger over the shooting to build public support for a push into North Waziristan. The other claims more fighting isn't the answer and would trigger a violent backlash. They recommend peace negotiations and ending Pakistani support for the U.S. war in Afghanistan. A Taliban gunman shot and critically wounded Malala on Oct. 9 as she was returning home from school in Pakistan's northwest. The militant group targeted her because of her vocal support for girls' education and criticism of the insurgents' behavior when they took over the scenic Swat Valley where she lived several years ago. Pakistan's powerful army chief strongly criticized the attack shortly after it occurred, raising expectations that the military might be laying the groundwork for an operation in North Waziristan. The army conducted a concerted public relations campaign before it launched an offensive in Swat in 2009 by seizing on anger over a video showing a Taliban fighter flogging a woman who allegedly committed adultery. "We refuse to bow before terror," Gen. Ashfaq Parvez Kayani said the day after Malala was attacked. "We will fight, regardless of the cost." A prominent Pakistani politician urged the military to take on the Taliban in North Waziristan while addressing tens of thousands of people rallying support for Malala in the southern city of Karachi on Sunday. "Move ahead and crush the Taliban, and 180 million people will be standing behind you," the head of the Muttahida Qaumi Movement, Altaf Hussain, told the crowd by telephone from London. Pakistani Interior Minister Rehman Malik said last week that the government was considering a military operation in North Waziristan, although he backtracked a few days later. The military has long recognized the threat posed by Pakistani Taliban militants holed up in North Waziristan but has been reluctant to launch an offensive there for several reasons. The army has said its troops are stretched too thin by operations in other parts of the tribal region. But many analysts believe Pakistan does not want to cross other militant groups with whom it has historical ties and could be useful proxies in Afghanistan after foreign forces withdraw. These groups, also located in North Waziristan, have primarily focused their fighting on Afghanistan, and any operation that upsets them could prompt them to turn their guns on Pakistan. Islamabad has also faced the challenge of launching an operation in North Waziristan without looking like it was simply doing the bidding of the United States, which is extremely unpopular in the country. 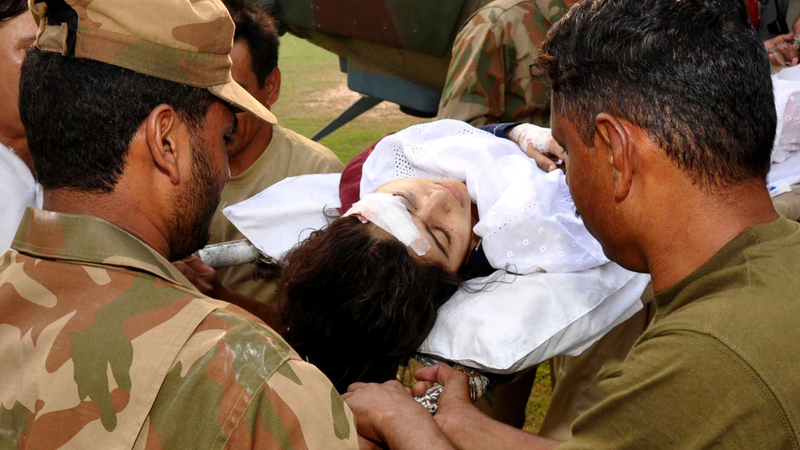 Opponents of military action against the Taliban, mainly right-wing Islamists, realized that outrage over Malala's shooting could provide the government with the cover needed to conduct a North Waziristan offensive without looking like a U.S. stooge. They responded by publicly accusing the government of using the attack as a pretext to fulfilling U.S. demands. "We condemn the attack on Malala, but this attack took place in Swat, and we fail to understand why the government issued statements about launching an operation in North Waziristan," said Hafiz Hussain Ahmed, a senior leader in the Jamiat Ulema-e-Islam party. "They wanted to play politics on this issue." Pakistani politician Imran Khan, a former cricket star, told Geo TV on Tuesday that "military action is not a solution." He and many on the right believe the driving force behind the insurgency is Pakistan's unpopular alliance with the United States and that the proper path forward would be for Islamabad to end its support for the war in Afghanistan and conduct peace talks with the militants. Critics point out that past peace deals with the Taliban have failed and that the militant group has repeatedly said it is fighting the Pakistani government both because of its ties to the U.S. and to establish Islamic law throughout the country. Opinion among average Pakistanis about a North Waziristan operation is also mixed. Zamman Watto, a lawyer in the eastern city of Lahore, said the government should not launch an offensive because "this will have a very adverse impact on the security situation in the country in the form of suicide attacks by the militants." Maqbool Khan, a teacher in the northwest city of Peshawar, urged the military to push into North Waziristan, saying "the government should act against terrorists wherever they are hiding." The government will need to move quickly if it wants to capitalize on public outrage over the attack, said Maleeha Lodhi, a former Pakistani ambassador to the U.S.
"As time passes on from the Malala incident, public opinion could shift again, as it often has in the past after a terrorist attack," Lodhi wrote in a column in The News on Tuesday. "The window of public consent for any action will then begin to close."